You pay [C] less to retreat Hoppip for each [G] Energy attached to it. Hoppip does 10 damage to itself. It can have -53 retreat. 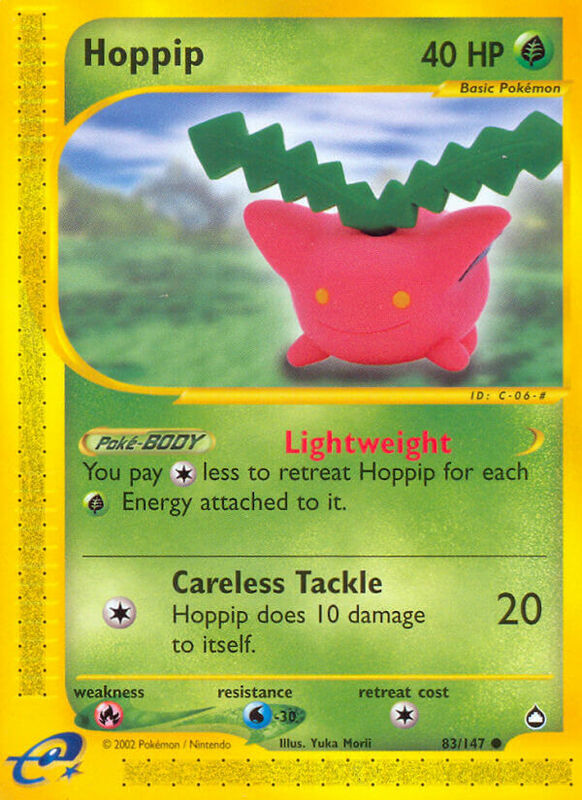 I Hoppip, 1 prize, I SAB, 5 cards left in your hand afer you deck out, 52 energy attached to Hoppip. You’ve already decked out. You wouldn’t get the extra turns to attach the energy. What if you N’d yourself to 1? So that would be -57 retreat. You win. Only -56. I realized a math error I made earlier. The Skyarrow brings it down to 0, then the 56 energies bring it to -56. Most pointless discussion I have stumbled upon. What does minus retreat do? Blocks up things like Dark Muk, HGSS Wobbuffet, etc.